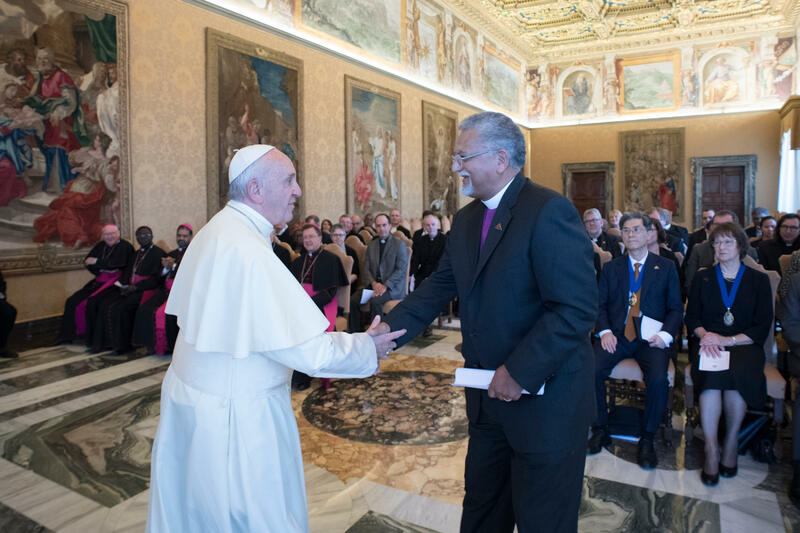 “As a result of these fifty years of patient, fraternal dialogue, we can truly say to one another in the words of the Apostle Paul: “you are no longer strangers,” Pope Francis said October 19, 2017, during an audience in the Consistory Hall with a Delegation of the World Methodist Council, on the occasion of the 50th anniversary of the beginning of the Methodist-Catholic theological dialogue. “Yes, we are no longer strangers, either in our hearts or in our belonging to the Lord, thanks to the one Baptism that has made us true brothers and sisters. We are, and we feel ourselves to be, members of the household of God,” the Holy Father said, citing the Apostle Paul in his letter to the Ephesians. I thank Bishop Abrahams for his kind words and I offer all of you a warm welcome on this fiftieth anniversary of the inauguration of the Methodist-Catholic theological dialogue. In the Book of Leviticus, the Lord proclaims the fiftieth year as a special year that calls, among other things, for the setting free of slaves: “You shall hallow the fiftieth year, and proclaim liberty throughout the land to all its inhabitants” (Lev 25:10). We are grateful to God because we can say that, in certain sense, we too have been freed from the slavery of estrangement and mutual suspicion. The Lord also told Moses that in the fiftieth year “everyone shall return to his property and… to his family” (ibid.). As a result of these fifty years of patient, fraternal dialogue, we can truly say to one another in the words of the Apostle Paul: “you are no longer strangers” (cf. Eph 2:19). Yes, we are no longer strangers, either in our hearts or in our belonging to the Lord, thanks to the one Baptism that has made us true brothers and sisters. We are, and we feel ourselves to be, “members of the household of God” (ibid.). We have come to this realization as the result of dialogue. The Second Vatican Council continues to encourage the growth of knowledge and esteem between Christians of differing confessions by means of a dialogue carried out “with love for the truth, with charity, and with humility” (Unitatis Redintegratio, 11). True dialogue gives us the courage to encounter one another in humility and sincerity, in an effort to learn from one another, and in a spirit of honesty and integrity. We are brothers and sisters who, following a long separation, are happy once more to see and learn about one another, and to move forward with open hearts. So let us advance together, knowing that our journey is blessed by the Lord. It began from him, and it leads to him. “You shall hallow the fiftieth year”, God said to Moses. The latest document of the Commission spoke precisely about holiness. John Wesley sought to help his neighbors live a holy life. His example and his words encouraged many to devote themselves to reading the Bible and to prayer, and in this way to come to a knowledge of Jesus Christ. When we see others living a holy life, when we recognize the working of the Holy Spirit in other Christian confessions, we cannot fail to rejoice. It is impressive to see how widely the Lord sows his gifts; it is impressive to see brothers and sisters who embrace in Jesus our own way of life. But other “members of God’s household” can also help us grow closer to the Lord and spur us to bear more faithful witness to the Gospel. Let us thank the Father, then, for all that he granted us, even before the last fifty years, in bygone centuries and throughout the world, in our respective communities. Let us strengthen one another by our witness to the faith. Faith becomes tangible above all when it takes concrete form in love, particularly in service to the poor and the marginalized. “You shall proclaim liberty throughout the land to all its inhabitants”: after fifty years of our dialogue, this ancient summons of the word of God remains ever timely. As a call to life in communion with God, the call to holiness is necessarily a call to communion with others too. When, as Catholics and Methodists, we join in assisting and comforting the weak and the marginalized – those who in the midst of our societies feel distant, foreign and alienated – we are responding to the Lord’s summons. As we look to the future, beyond the past fifty years, one thing is certain: we cannot grow in holiness without growing in communion. This is the journey that awaits us in the new phase of the dialogue, devoted to reconciliation. We cannot speak of prayer and charity unless together we pray and work for reconciliation and full communion. May your discussions about reconciliation be a gift, and not only for our communities but for the world. May they be an incentive to Christians everywhere to be ministers of reconciliation. The Spirit of God brings about the miracle of reconciled unity. He does so in his own way, even as he did at Pentecost, awakening a variety of charisms and ordering everything in a unity that is not uniformity but a communion. We need, then, to remain together, like the disciples awaiting the Spirit, and as brothers and sisters on a shared journey.